Which job boards are the best for hiring developers? Job boards are a mess. They can be expensive, and their ROI is a total unknown. Still, hiring is too important not to know of every tool available. 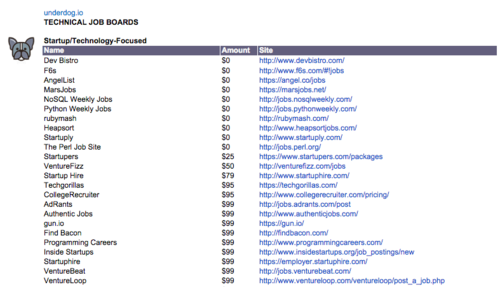 We thought we’d share an internal list of technical job boards that we’ve created over the past few years. We understand that we compete with some of these guys, but we’re not worried. Like we said, job boards can be messy. Only with Underdog.io do you get a reliable stream of qualified candidates every week. Here’s a Google Doc of the list to make your life easier. If you have additions/subtractions, hit us up on Twitter. Builders Build Startups. Recruiters Don't.